The story: I was helping out on a Chinook Tagging operation on the isolated Phillips River and one evening I took a trip up to a tributary called the Clearwater. 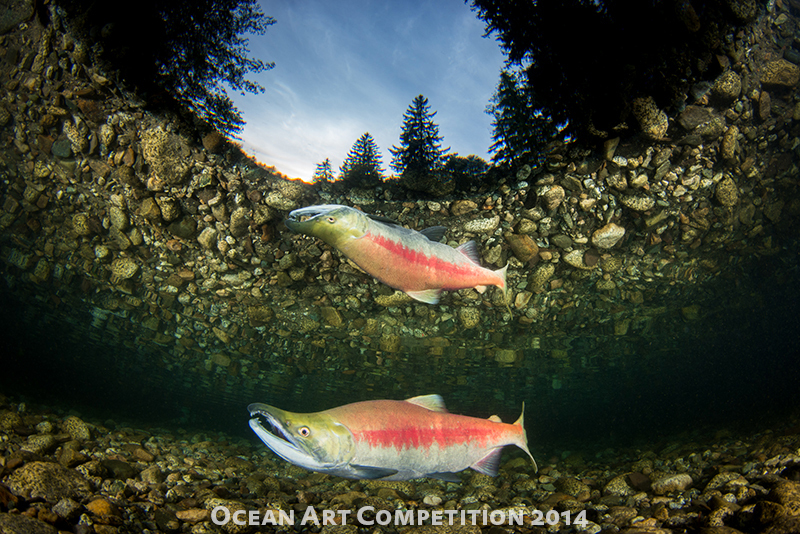 There is a good sized Sockeye Salmon run on this stream. I positioned myself in a slow flowing channel where the fish were congregating for spawning and slowly approached a pair. I rested in about 8" deep water and the male started slowly circling out to investigate me. After about 10 minutes, remaining motionless and never taking my eye from the viewfinder, I was able to get this image when he was the closest to me and the light was fading. Location: Clearwater Creek (a tributary of the Phillips River), West British Columbia, Canada.